Tooth extractions are a fairly common procedure. When the prognosis on a tooth or several teeth is poor due to deep decay or fractures, an extraction may be recommended. 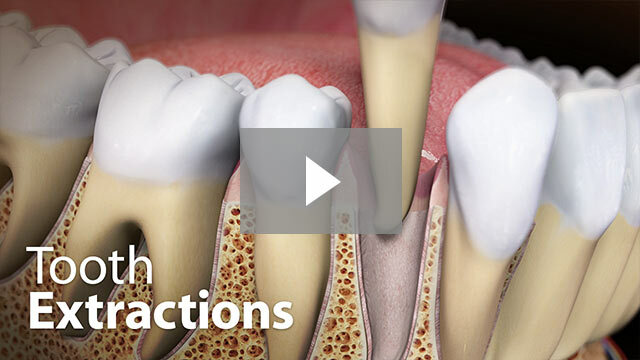 Extractions can range from a single tooth to multiple teeth. Depending on the incision and extraction site, sutures may be placed. Due to slight bleeding, gauze will be placed and post operative instructions given. After the surgery you will need to rest. You can expect the site to bleed for a little while and your gauze may need to be changed. If bleeding continues longer than 24 hours, please contact the office. Rest for the first 24 hours but do not lie flat, prop you head on a pillow. Fox River Grove Dentist. Dr. Michael Zgoba provides Extractions, oral surgery, wisdom teeth extractions, oral surgeon, wisdom tooth surgery, tooth removal, surgical extractions to patients suffering from tooth decay, tooth infections, impacted teeth, wisdom teeth, extra teeth, fractured teeth in Cary, IL, Barrington, Crystal Lake, Algonquin. Cary, IL Dentist providing Extractions in Fox River Grove, Illinois.